The formal start to the European Union was the establishment of a ‘common market’ for coal and steel in six west European countries. This was the European Coal and Steel Community (ECSC) signed as the Treaty of Paris in July 1951. This institution was intergovernmental, had a High Authority and a Council of Ministers which used a qualified majority voting’ system. 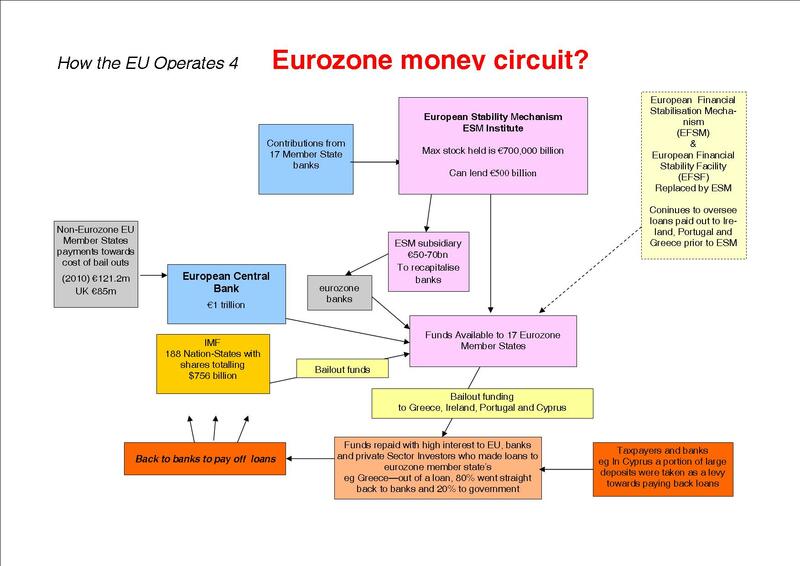 The ECSC was given some sovereign powers over these national basic industries from the six Member States – West Germany, France, Italy and the Benelux countries. Britain rejected membership of the ECSC. A majority of companies in the iron, steel and coal industries had been nationalised in February 1951 by the Atlee Labour Government which did not want to lose control of these fundamental sectors of the economy. The National Coal Board became the largest industrial employer in Western Europe with 500,000 employees. The coal, steel, shipbuilding and manufacturing industries were the basis of Britain’s economy. Trade unions in these industries along with the railways formed the backbone of the labour movement. The welfare state had been extended and the NHS set up in 1948. To help pay for these Britain wanted to keep vested interests in the nation-states of the Commonwealth and continue exploiting the colonies of the British Empire. The latter required the umbrella of the USA’s military machine and hence support for her foreign policy. The real reasons for setting up the ECSC included the long term political aim of a federal super-national state or United States of Europe. This is why the Atlee government rejected the plan. What was known as the Schumann plan was deliberately cloaked in a language to keep this aim hidden. The plan was to dismantle the nation-states in stages to bring about their end which also meant the demise of democracy. This plan had been announced on the 9 May 1950 which subsequently became known as Europe Day. An important aspect thrown in for public consumption and to help convince the decision makers to support the establishment of the ECSC was to prevent a third war on the continent between France and Germany. France was deeply concerned about a resurgent Germany. The heavy industry in the Ruhr valley had contributed to the Nazi war machine and France wanted this dismantled. The same industry had been used in the First World War. The USA, Britain and West Germany did not want the heavy industry in the Ruhr dismantled as it was part of the overall west European military-industrial-complex needed to square up to the perceived threat of the USSR. This perception was aided by the Korean War which had started in 1950 as a dreadful symptom of the ‘cold war’. At the same time France was heavily embroiled in guerrilla wars in the re-occupied colonies of Indo-China – Laos, Cambodia and Vietnam. The six year background following the end of the Second World War included recovery from extensive war damage across the continent. In western and southern Europe the USA dominated and used the loan of the Marshall Plan, occupation troops and military bases to ensure capitalism held sway and socialism was staved off. It was also politically important to reduce unemployment and social deprivation to prevent any revolutions breaking out. In eastern and central Europe the USSR in effect handed socialist revolutions out on a plate. Two exceptions were Austria which was turned into a neutral buffer state and Yugoslavia which had mounted a forceful resistance against the Nazi occupation. Germany had been divided into sectors controlled by the USSR, USA, France and Britain. Berlin well inside the USSR controlled sector was divided between the four Allies. In 1949 the American, French and British sectors were combined to enable the State of the Federal Republic of Germany to be formed. When West Germany ratified the Paris Treaty in 1951 the dismantling of Germany’s industries was halted. The ECSC was put in place in 1952 and restrictions on industrial production in West Germany were lifted. Both these steps were a precursor to the re-armament of West Germany. 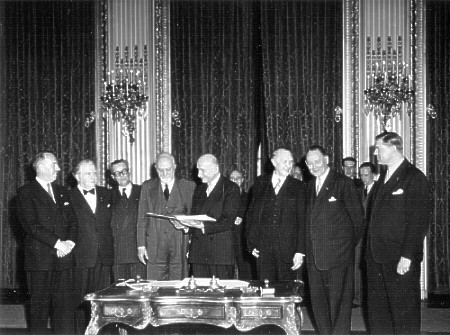 Signature/ratification of Paris Treaty in April 1951. Ardenhaur, Chancellor of Germany is third from the right. 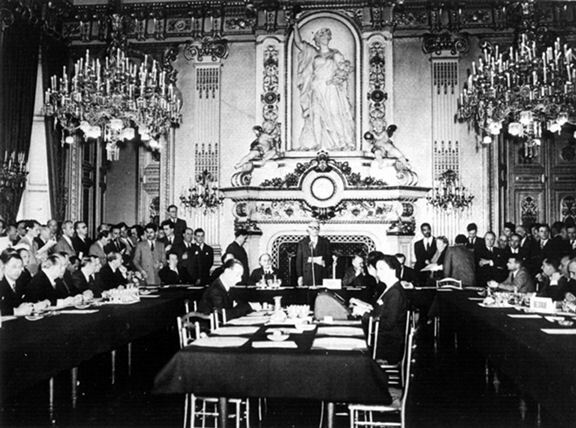 The Treaty was signed by France, Federal Republic of Germany, Italy, the Netherlands, Luxembourg and Belgium. The operation of ECSC included controls on production of steel and mining of coal. A common market for steel and coal was put in place and tariffs removed between the six Member States in a market where there was free movement of these products. Coal mines and steel plants deemed inefficient were shut down with compensation and some retraining schemes. Such decisions were made in secret by the unaccountable and unelected High authority of eight members and a Council of Ministers and not by national governments. There was a check on their decision making by a European Court of Justice based in Luxembourg. Each Member State appointed one judge and a seventh judge was appointed in turn by France, Germany and Italy to make the bench an odd number to avoid tied votes. This Court is now the highest Court of the EU. The original plan had been to use the Council of Europe’s Court but Britain vetoed that move. This latter Court is the European Court of Human Rights based in Strasbourg and is not part of the EU. A Common Assembly of 78 MPs appointed by national government ministers had a supervisory role over the High Authority but in practise was powerless except to sack members of the High Authority for various misdemeanours. This institution is now the European Parliament still without any meaningful powers. The ECSC laid the basis for the thrust to Euro-federalism, free market and EU institutions which are in place today. There have been various attempts to set up a unitary European state including by Napoleon and Hitler. 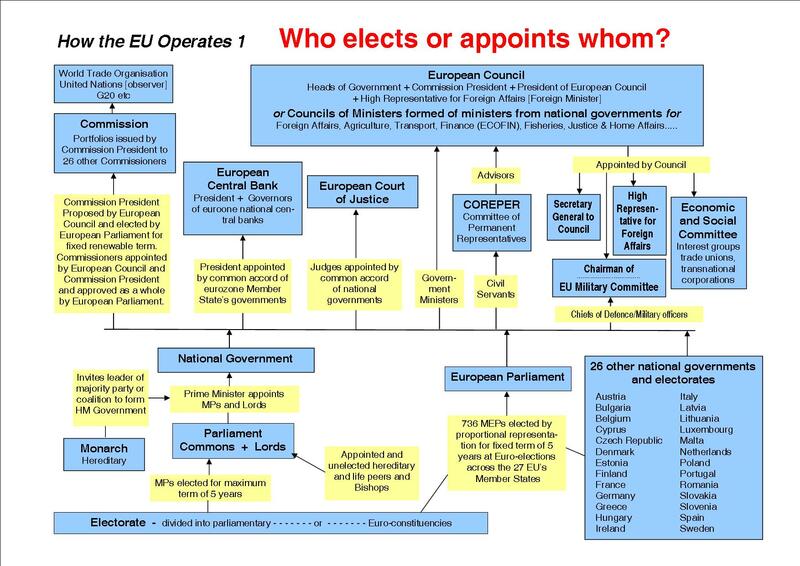 This is the initial piece in a series on how the EU was first thought of and includes Treaties and other major stages right up to the Lisbon Treaty.